CLIMATE CHANGERS - Guinness World Records could one day record this vessel as the slowest solar electric circumnavigations, or it may prove to be the first hydrogen fuel cell assisted world navigation, but this would only form part of the energy storage system along with batteries and is not the primary energy source, that is of course the sun. That said the inclusion of a new energy bank would qualify this team from France as potential climate changers. Victorien Erussard, an experienced ocean racer from the city of Saint-Malo in the north of France, was halfway through a dash across the Atlantic when he lost all power. Sails kept the boat moving, but Erussard relied on an engine and generator to keep the electronics running. He temporarily lost his autopilot and his navigation systems, jeopardizing his chances of winning the 2013 Transat Jaques Vabre race. Never again, he thought. “I came up with the idea to create a ship that uses different sources of energy,” he says. The plan was bolstered by the pollution-happy cargo ships he saw while crossing the oceans. "These are a threat to humanity because they use heavy fuel oil." 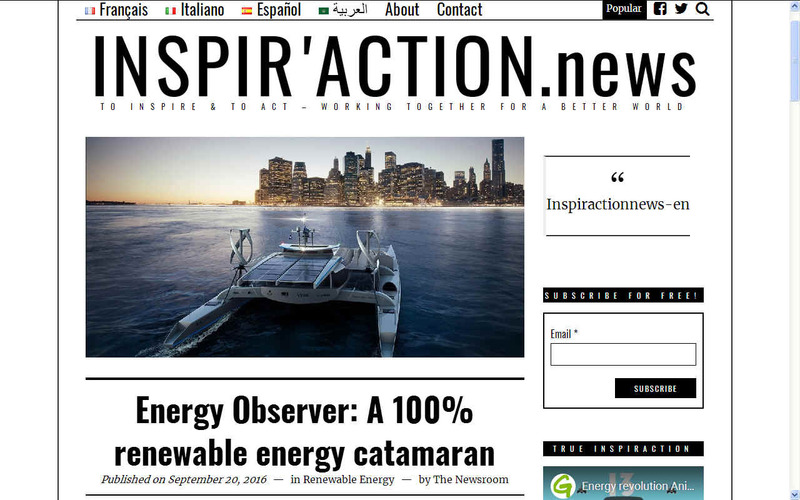 INSPIRACTION.NEWS SEPTEMBER 2016 - It will be a world’s first. 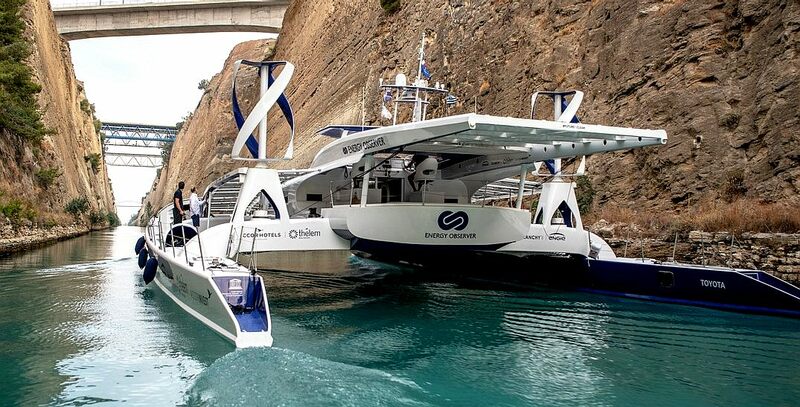 The Energy Observer is an experimental catamaran that combines solar, wind and self-generated hydrogen intelligently. The challenge? Navigate for 5 years around the world as part of an expedition to the energy transition with the ambition to be the world’s first boat to be energy self-sufficient. “Energy Observer” is actually the latest transformation of a famous racing yacht built in Quebec in 1983, the “Formula Tag”. Designed by Nigel Irens and skippered by Peter Blake, this catamaran was then considered the largest in the world and has a more than respectable chart since it won the Jules Verne Trophy in 1994 under the name of Enza after having completed a world tour in 74 days. The legend of sailing has been resurrected like a phoenix on its 33 years anniversary. The team behind this crazy project is very diverse: first marine Victorian Erussard and Frederic Dahirel, then the director-diver Jerome Delafosse and engineers from Innovation Laboratory for New Energy Technologies and Nanomaterials (Liten) of CEA Tech. To produce energy, “Energy Observer” combines hydro, solar panels and vertical axis wind turbines. It will store this energy in fuel cells, Li-Ion batteries as well as hydrogen produced by electrolysis of seawater. For propulsion, it uses a semi-automated traction kit which will allow it to bypass the pole. 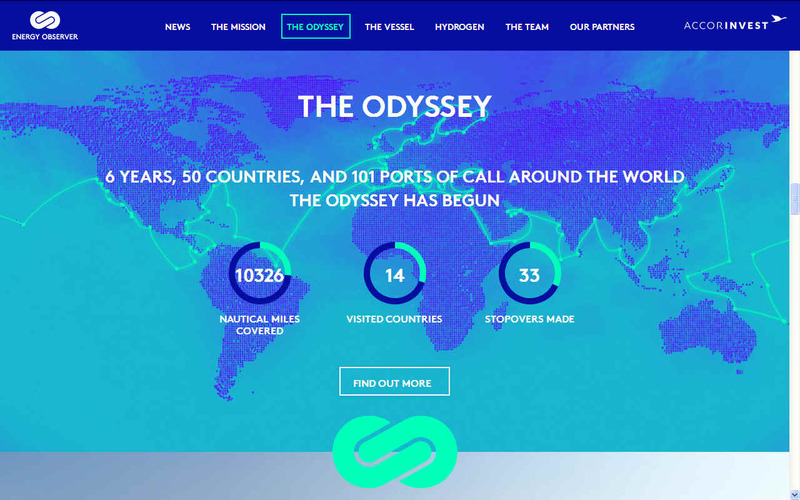 This odyssey of modern times will take place in two stages: from 2017 to 2019, a tour of Europe and then from 2020 to 2022, around the world to address all continents with 101 stops to set and meet innovative and practical solutions to enable better life while protecting the environment and the planet. Jerome Delafosse, on board, will produce images of this scientific and educational epic alongside Florence Lambert, Director of Liten, and Nicolas Hulot is also sponsoring “Energy Observer”. Beyond the image and the symbol, “Energy Observer” should also help to develop clean energy solutions for terrestrial applications, by testing them at sea. Helm to starboard, then, to the energies of tomorrow for its maiden journey in February 2017! Five years on, that idea has taken physical form in the Energy Observer, a catamaran that runs on renewables. 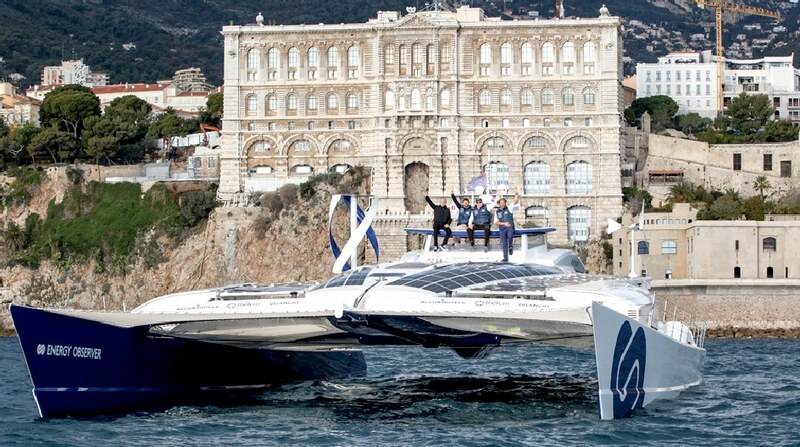 In a mission reminiscent of the Solar Impulse 2, the solar-powered plane that Bertrand Picard and André Borschberg flew around the world a few years back, Erussard and teammate Jérôme Delafosse are planning to sail around the planet, without using any fossil fuel. Instead, they'll make the fuel they need from sea water, the wind, and the sun. The Energy Observer started life as a racing boat but now would make a decent space battle cruiser prop in a movie. Almost every horizontal surface on the white catamaran is covered with solar panels (1,400 square feet of them in all), which curve gently to fit the aerodynamic contours. Some, on a suspended deck that extends to the sides of the vessel, are bi-facial panels, generating power from direct sunlight as well as light reflected off the water below. The rear is flanked by two vertical, egg whisk-style wind turbines, which add to the power production. Propulsion comes from two electric motors, driven by all that generated electrical energy, but it’s the way that’s stored that’s clever. The Energy Observer uses just 106-kWh (about equivalent to a top-end Tesla) of batteries, for immediate, buffer, storage and energy demands. 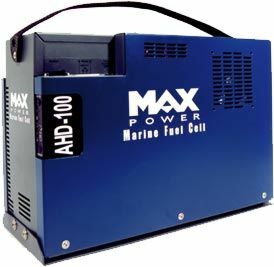 It stores the bulk of the excess electricity generated when the sun is shining or the wind is blowing as hydrogen gas. An electrolyzer uses the current to spilt the water into hydrogen and oxygen. The latter is released into the atmosphere, and the H2 is stored in eight tanks, made from aluminum and carbon fiber, which can hold up to 137 pounds of compressed hydrogen. When that energy is needed, the H2 is run through a fuel cell and recombined with oxygen from the air to create electricity, with water as a byproduct. That’s the same way fuel cell cars, like the Honda Clarity and Toyota Mirai work. 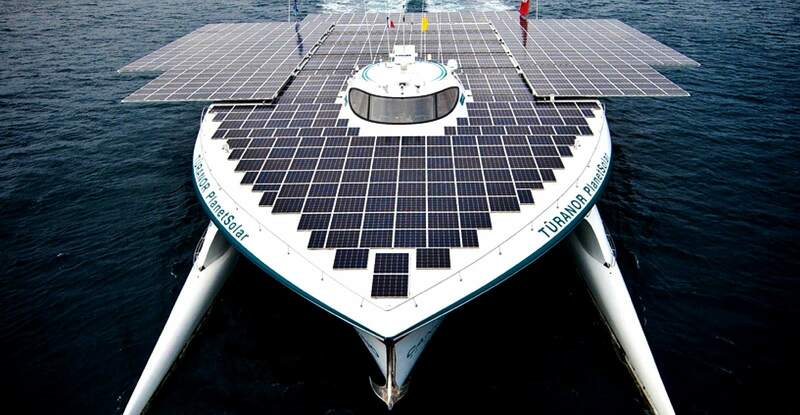 By storing energy this way instead of with banks of batteries, Erussard made the Energy Observer three times lighter than the similarly sized MS Tûranor PlanetSolar, which became the first boat to circumnavigate the globe using only solar power in 2012. And the new vessel is kind to the ears as well as the planet. “There’s zero sound pollution, it’s a true pleasure to navigate on this vessel,” Erussard said on stage at the recent Movin’On future mobility conference in Montreal, Canada. Inside there’s a gleaming white helm, with two captains chairs, and living quarters that wouldn’t look out of place in 2001: A Space Odyssey, with an almost harshly minimalist white design. The team designed the furnishings to be as light as possible too, because a lighter boat uses less energy, and so is more efficient. The team isn’t rushing things. The mission started in June 2017, and will last six years, reach 50 countries, and make 101 stops. The vessel has already travelled 7,000 nautical miles, to port cities around the French coast, and is now in the Mediterranean. It’s due to arrive in Venice on July 6, and spend 10 days in port, where the crew will meet the public, and set up an interactive exhibit to showcase environmentally friendly technologies. “The idea with this ship is to prove a potential energy system of the future,” Erussard says. He’s determined that the same types of energy generation and storage that he’s using onboard could be used on land too, to reduce dependence on fossil fuels, and maybe one day to clean up those container ships he'll pass en route. Designed in partnership with a naval architect team and the CEA-LITEN [fr] of Grenoble, this experimental vessel is going to be the first with autonomous means of producing hydrogen on board and without emitting greenhouse gas emissions using renewable energies. 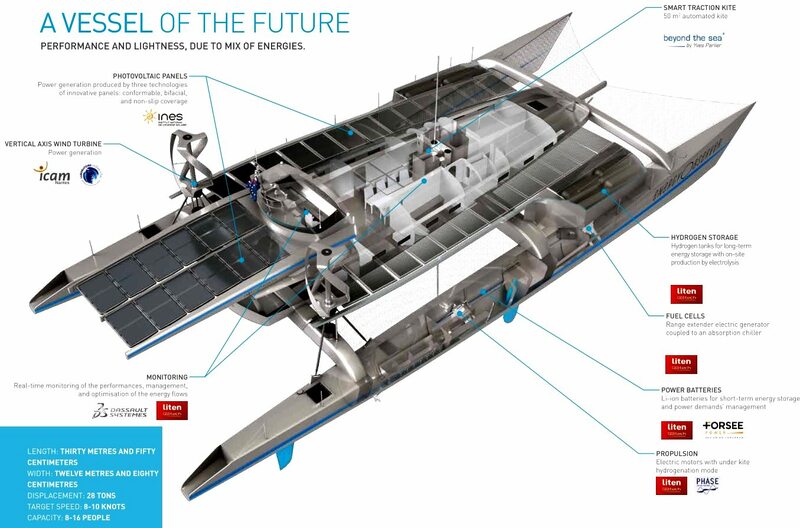 The boat will produce and store hydrogen using seawater thanks to an energy mix involving: 3 types of solar panels spreading over a surface of 130 square meters (21 kW peak), 2 vertical axis wind turbines (2 x 1 kW), 1 traction kite and 2 reversible electric motors (2x41 kW) of hydrogenation, 1 lithium battery (106 kWh), 1 desalinisator, 1 electrolyser, 1 compressor, 1 fuel cell (22 kW), and 62 kg of hydrogen. The complete hydrogen system weighs 2100 kilos. A new, lighter battery is to be implemented in 2019. 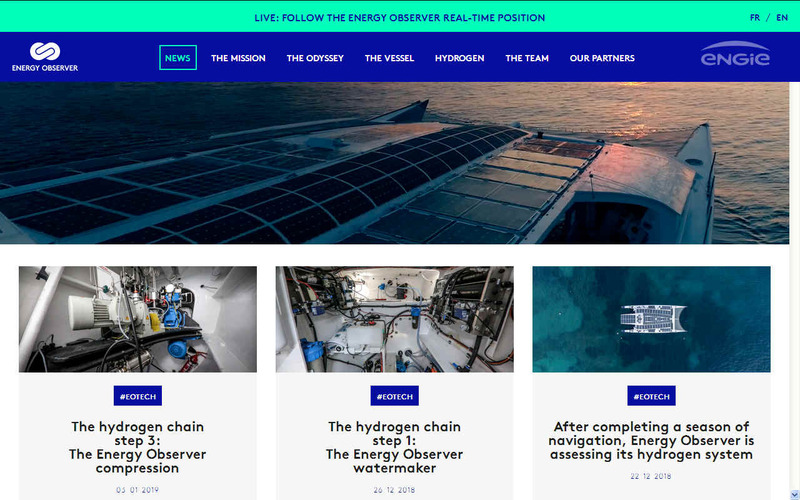 Energy Observer is to be the first hydrogen vessel to navigate the world, launched in April 2017. Developed in collaboration with engineers from the CEA-LITEN, the boat will test and prove the efficiency of a full production chain that relies on the coupling of different renewable energies. Following its launch, the boat left in the Spring 2017 for a world tour lasting 6 years in order to optimize its technologies and lead an expedition that will serve durable solutions for energy transition. The boat was nominated first French ambassador of the Sustainable Development Goals by the French Ministry for an ecological and solidary transition. Energy Observer is a floating laboratory, destined to test an innovative energy architecture in extreme conditions, to prove its feasibility onshore. The energy system encompasses 3 renewable energy sources (sun, wind and hydropower) and two types of storage (li-ion batteries for the short-term and hydrogen for the long-term). The ship can produce hydrogen directly onboard, through seawater electrolysis. The goal is to test and optimize these technological bricks, in order to have them working in harmony, and aim toward total energy autonomy. Each year, the vessel will go back to the shipyard to analyze the navigation and the evolution of the embarked technologies. MONACO - Bertrand Piccard, founder of the Solar Impulse Foundation, Victorien Erussard, H.S.H. Prince Albert II of Monaco and Jérôme Delafosse in Monaco. Victorien Erussard, offshore racer and merchant naval officer, will lead the expedition along with Jérôme Delafosse, professional diver and producer of wildlife documentaries. By their side, a team of over 30 people, architects, designers, and engineers, spreading from Saint-Malo to Paris to Grenoble have been working since 2015 on refurbishing the catamaran. The boat was nominated first French ambassador of the Sustainable Development Goals by the French Ministry for an ecological and solidary transition. Energy Observer launched in winter 2017 for a series of tests at sea before its big departure from Saint-Malo in the spring. It will call in at Paris for a first event where the boat will be officially baptised. This event will celebrate the start of a six-year expedition, scheduled from 2017 to 2022, visiting 50 countries and 101 ports of call including: historical ports, wildlife sanctuaries, natural reserves, endangered ecosystems, and international events. Expedition goals include reconciling ecology and technology, and proving that it is possible to reduce our impact on the environment without reducing our comfort. NAVIGATION - Apart from the energy acquisition and storage system, the catamaran is he same boat that was used for yacht racing events using sails. CUTAWAY DIAGRAM - This drawing shows the layout of the boat as it is was after the conversion to renewables and electric drives. This is an excellent way of recycling old racing vessels once they become uncompetitive. ROUTE MAP - With so many ports to visit, many of which are above the equator, it is no wonder that this voyage will be epic and leisurely in pace, not in any way detracting from the endeavour and the spirit of adventure of these two French pioneers. ENERGY OBSERVER - Energy Observer is a former race boat that has been reconditioned, lengthened (four times) and fitted with solar panels and wind turbines, she was built in Canada in 1983 by naval architect Nigel Irens for Mike Birch. The maxi-multihull called Formule TAG, was the first racing catamaran to achieve 500 miles in 24 hours in 1984. She is now: Length 30,5 metres x Width 12,80 metres x Weight 28 metric tons and can do between 8-10 knots. The plan is to sail her around the world in 6 years, to demonstrate a mix of technology including a hydrogen fuel cell in the energy conversion process, presumably to increase the efficiency and longevity of fuel cells, or maybe show cost effectiveness. We like the look of the vertical helical turbines, even though they have a limited output. 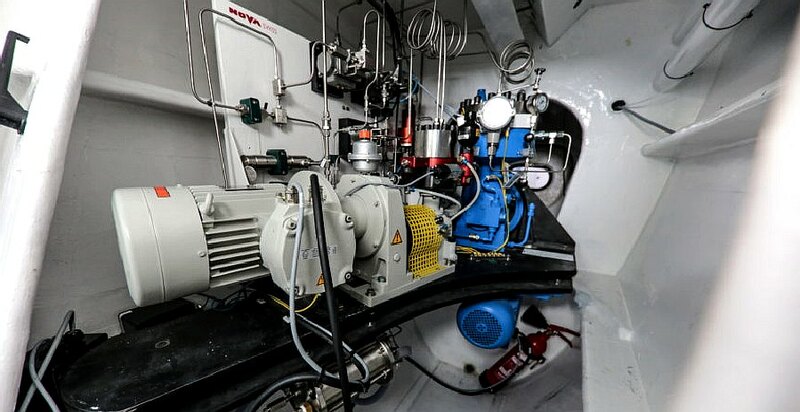 The power to weight ratio is something to consider, where axial flow turbines are more efficient on a kilogram for kilogram basis, but have the disadvantage of requiring robotic controls to get the best from them. Energy Observer es un catamarán experimental, un laboratorio flotante de la energía, que pretende dar la vuelta al Mundo siendo energéticamente autónomo, toda la energía que necesita la produce el propio barco, y sin generar ningún tipo de emisión contaminante. ¡Un barco del futuro! Para ello cuenta con 130 m2 de paneles solares, 2 aerogeneradores de eje vertical, 1 cometa inteligente de 50 m2 y 2 motores eléctricos reversibles. Cuando el catamarán es arrastrado por la cometa los motores eléctricos generan una corriente eléctrica que permite producir hidrógeno a partir de la electrolisis del agua marina. De hecho, este catamarán experimental será el primer barco capaz de producir hidrógeno a bordo por sus propios medios. El hidrógeno generado es almacenado para ser utilizado posteriormente en una pila de combustible durante los periodos en los que no haya sol ni viento. También cuenta con una serie de baterías de ion-litio, para el almacenamiento de energía a corto plazo. El proyecto Energy Observer gira en torno a un barco-laboratorio que pretende demostrar y difundir diversas tecnologías energéticas innovadoras, limpias y eficientes que nos permitan acometer de forma satisfactoria la inminente transición energética. Es por así decirlo un laboratorio flotante de futuras energías. Una demostración de que nuestro paso por la tierra no tiene por qué asociarse irremediablemente con la contaminación y los desechos. Diseñado y desarrollado en colaboración con un equipo de arquitectos navales y el CEA-LITEN de Grenoble, Energy Observer pretende probar la eficiencia y viabilidad de una cadena de producción de energía en base a diferentes tecnologías renovables. Este catamarán sigue la estela de otros proyectos similares. Por ello se le apoda en ocasiones “Solar Impulse of the seas” por la similitud tecnológica y de pretensiones con el avión solar que recientemente completó su vuelta al mundo. Uno de los pilares fundamentales en el sistema energético del Energy Observer es la posibilidad de producir hidrógeno a bordo. Dado que las energías eólica y solar, que son las que cubrirán la demanda energética del buque la mayor parte del tiempo, son intermitentes, es de vital importancia lograr almacenar la energía de forma eficiente. Las baterías sirven como acumuladores de energía eléctrica a corto plazo. Sin embargo, no son eficientes para almacenar grandes cantidades de energía pues el volumen necesario de baterías sería muy grande. Ahí entra el hidrógeno como vector energético. La energía se almacena en forma de hidrógeno, de manera que este se utiliza en una pila de combustible cuando el resto de fuentes de energía estén inoperativas, es decir, cuando el sol no brille ni haya viento. El Energy Observer, por lo que he podido leer, producirá el hidrógeno a partir de la electrolisis de agua marina. La electricidad necesaria para llevar a cabo el proceso la obtendrá bien de los 2 motores eléctricos reversibles cuando el catamarán es arrastrado por la cometa o bien del exceso de producción de las placas solares y los aerogeneradores. Esta tecnología convierte al Energy Observer en uno de los barcos tecnológicamente más avanzados, y el primero en ser capaz de producir hidrógeno a bordo. 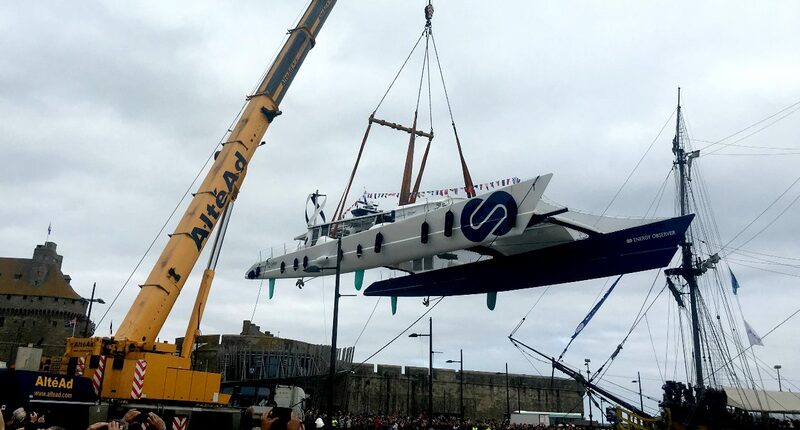 El catamarán debería ser presentado en sociedad dentro de poco, para en primavera, en torno a abril, iniciar su recorrido mundial partiendo del histórico puerto de Saint-Malo, ciudad en la que ha sido acondicionado. Un viaje de 6 años (2017-2022) siendo autosuficiente energéticamente y sin emitir gases contaminantes, que le llevará a visitar 50 países y 101 puertos. Hará escala tanto en puertos históricos como en reservas naturales, ecosistemas en peligro de extinción y eventos internacionales. Esta expedición pretende conciliar ecología y tecnología, demostrado que es posible reducir nuestro impacto sobre el medio ambiente sin reducir nuestra comodidad. El Energy Observer es un barco de leyenda, como La Perla Negra en Piratas del Caribe, solo que este ha ido cambiando de nombre con el tiempo. El arquitecto naval Nigel Irens construyó, bajo la supervisión del navegante Mike Birch, en 1983 en Canadá el que fue el catamarán más grande del mundo. Su innovadora configuración multicasco sentó cátedra y fue imitada por multitud de navíos posteriormente. Bautizado inicialmente como “Formule TAG” (Technique d’avant garde, en español técnica de vanguardia), fue el primer barco de vela capaz de navegar 500 millas (aprox 805 km) en menos de 24 horas, record que conquistó en 1984. En 1985 ganó la carrera Mónaco-Nueva York. Bajo el nombre de “Enza New Zealanda” conquistó en 1994 el Trofeo Julio Verne por la circunnavegación a vela más rápida del mundo, realizándola en 74 días 22 horas 17 minutos y 22 segundos. Su record estuvo vigente hasta 1997, cuando el Sport Elec lo batió. En 1997, siendo rebautizado como “Royal & Sun Alliance”, logró el record en el paso del Canal al realizarlo en 6 horas 49 minutos y 19 segundos. El año siguiente batió el record femenino de la Travesía del Atlántico Norte, llevándola a cabo en 9 días 11 horas 21 minutos y 55 segundos. En 2005 bajo el nombre de Daedaleus se alzó con el record en la Travesía del Atlántico Sur, el cual sigue ostentando a día de hoy. Si bien este es un pequeño resumen de la vida de este catamarán como feroz competidor de los mares y océanos, cuenta con muchas más carreras y travesías en su casco. Fue armado inicialmente como un barco de 24 m y 38 cm de eslora. Sin embargo, con el paso del tiempo se ha ampliado en 4 ocasiones y ha sufrido notables modificaciones en su configuración. Actualmente el Energy Observer cuenta con 30 m y 50 cm de eslora por 12 m y 80 cm de manga y pesa unas 20 toneladas. Detrás del diseño y reacondicionamiento del barco ha estado un equipo de más de 30 personas, entre arquitectos, diseñadores e ingenieros trabajando desde 2015 de forma conjunta entre Saint-Malo, París, Grenoble y Chambéry. Si bien, cuando el barco se haga a la mar viajarán a bordo únicamente cuatro marineros profesionales, un ingeniero y un cámara. Victorien Erussard, regatista de competición en alta mar y oficial de la marina mercante dirigirá la expedición junto con Jérôme Delafosse, buceador profesional y productor de documentales sobre la vida silvestre. * 2 aerogeneradores de eje vertical desarrollados por ICAM Nantes. * Cometa de tracción automatizada de 50 m2 desarrollada por Beyond the Sea®. * 2 motores eléctricos reversibles, capaces de producir hidrógeno cuando el catamarán es movido mediante la cometa. * Sistema de pila de combustible de hidrógeno acoplado a un refrigerador por absorción. 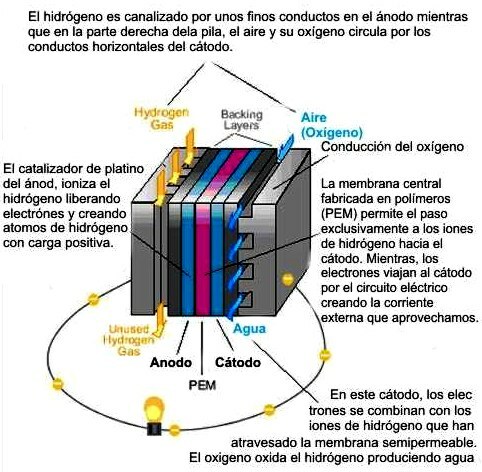 * Depósitos para almacenar el hidrógeno producido, almacenamiento de energía a largo plazo con producción in situ por electrólisis. * Baterías de ion litio de Forsee Power para el almacenamiento de energía a corto plazo y la gestión de las demandas de potencia. Debido a esta combinación de tecnologías, Energy Observer será el primer buque en el mundo capaz de producir hidrógeno descarbonizado a bordo, permitiendo al barco alimentarse indefinidamente con energía libre de emisiones. Las energías renovables son imprescindibles, pero no suficiente. Cuando el viento no sopla o el sol no brilla es necesario contar con un depósito de energía que permita al barco propulsarse así como seguir operando sus sistemas, ese es el papel del hidrógeno y la pila de combustible en este entramado energético. “Energy Observer es el paradigma de lo que serán las redes de energía del mañana, con soluciones que incluso podrían utilizarse en cinco años. Por ejemplo, las casas del mañana podrían incorporar un sistema de almacenamiento de hidrógeno, que se produce durante los meses de verano y luego se utiliza en el invierno”. Florence Lambert, directora de CEA-Liten. “Vamos a ser el primer barco con un medio autónomo de producción de hidrógeno. … Si no hay sol o viento, o si es de noche, el hidrógeno almacenado, generado por la electrólisis alimentada por paneles solares y dos turbinas eólicas, se hará cargo”. Victorien Erussard. “Energy Observer es sobre todo un desafío tecnológico. Es como el Solar Impulse del mar hecho en Francia. Nuestro objetivo es utilizar la naturaleza y las energías renovables y poder, gracias a ello, dar la vuelta al mundo de manera autónoma”. Victorien Erusard. “El hidrógeno no es un combustible, pero si una buena forma de almacenar energía. En lugar de baterías, llenamos los tanques de hidrógeno de alta presión y el hidrógeno puede alimentar nuestra pila de combustible y generar electricidad.” Jerome Delafosse. “Por primera vez, el Energy Observer nos permitirá explorar los océanos sin dejar ningún rastro detrás de nosotros,” Jerome Delafosse. Energy Observer transmite al sector tecnológico y a la sociedad en general un mensaje en favor de las energías renovables y las tecnologías asociadas no contaminantes. 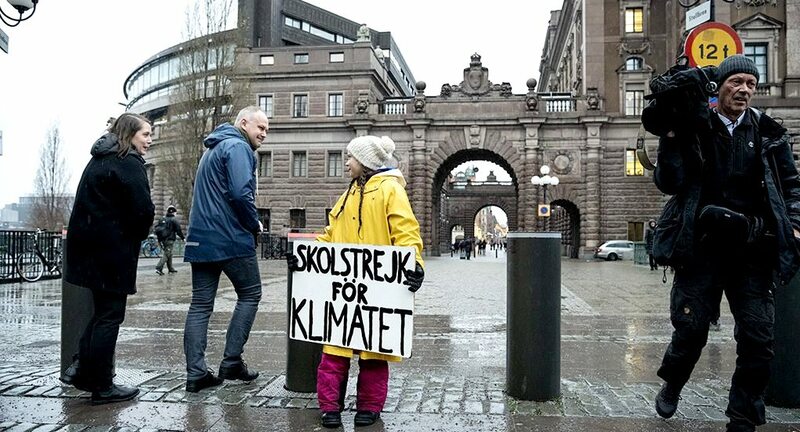 Este proyecto contribuirá sin duda a aumentar la concienciación de la gente en torno al inminente problema medioambiental y hacia sus posibles soluciones, y más en el abrupto escenario que se nos plantea actualmente. Además, será un excelente embajador del hidrógeno en su travesía a lo largo del mundo, difundiendo las bondades que esta tecnología presenta a la hora de almacenar y distribuir la energía. Pero su labor no se limita únicamente a la concienciación sino que es un verdadero demostrador tecnológico, un laboratorio en el que ensayar todos estos sistemas y tratar de solucionar los problemas que vayan surgiendo. Energy Observer es un ejemplo de cómo mediante soluciones innovadoras podemos construir una cadena de producción energética completamente limpia. Contamos con los medios para reducir nuestro impacto en el planeta, conocemos las tecnologías necesarias para ello, ahora el balón está en nuestro tejado. ¿Mostraremos el compromiso y la voluntad necesarios para llevar a cabo la transición energética? ELIZABETH SWAN CIRCUMNAVIGATION STUDY - The above table illustrates one of the most likely ocean awareness expedition routes showing the time elapsed in days for 7 knots average cruising speed, including times for 5 and 6 knot averages - allowing for 10% downtime and 36 days in ports. 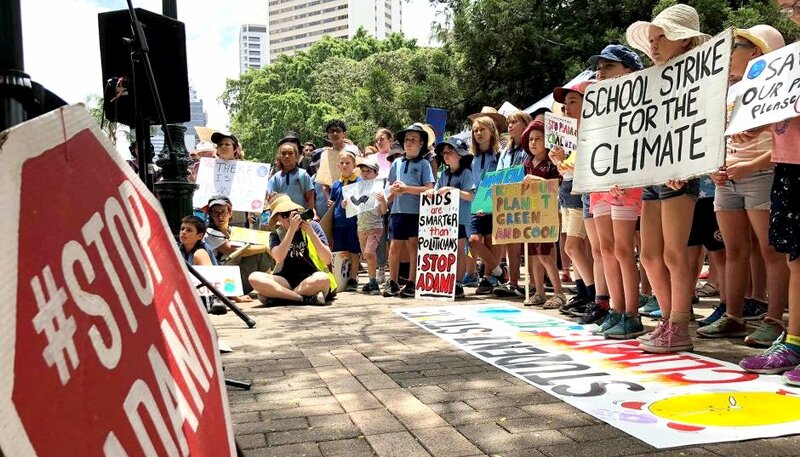 Hence, although the objective is to reduce the current solar circumnavigation record from 584 days, the event in not an outright non-stop yacht competition in the offshore racing sense. It remains to be seen how accurate such a prediction might be.